Charlotte Boden sits with her new library card and a book. 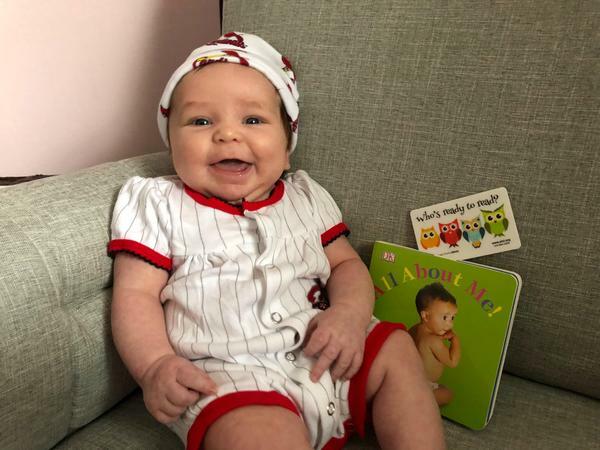 Kristen Sorth, the director of the St. Louis County Library, said the library decided to expand the program to Mercy Hospital St. Louis because it’s become one of the leading baby hospitals in St. Louis County. More than 12,000 library cards and Born to Read bags were given to new parents in 2018. The program got its footing in 2015, and more than 44,000 families have taken part since. Sorth said she encourages new parents to read to their kids even if they are infants. Sorth said parents are invited to the library to celebrate their child’s first birthday, where they’ll receive another book. You can find more information about Born to Read here.